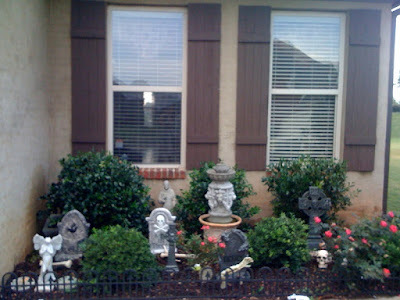 I have begun work on our haunted house for our Halloween party this year. Here is the beginning of my little cemetery. I'm happy with it, although it still needs a few touches. A couple of glass lanterns in there would be cool, but you know you could do one of those flickering pumpkin lights or a strobe to get a lightning effect. That'll be a great entry! add some cobwebs and a couple pumpkins with nasty faces and you've done it! Thanks. I'll try that. I needed some lighting effects for after dark. Pam,, you are right. I need cobwebs too. Spooky! I love how everyone is doing Halloween up right. I wish we could join in, but don't want to waste money on something no one would appreciate but us. There's something wrong with people in our neighborhood. Funny thing...When I first read the heading,I thought you had started a little pet cemetery for your pets..Then I saw the headstones in your front yard,and was a little startled..Thanks for the laugh on me!I do love your efforts..
Elk999us... I'm glad I gave you a laugh. 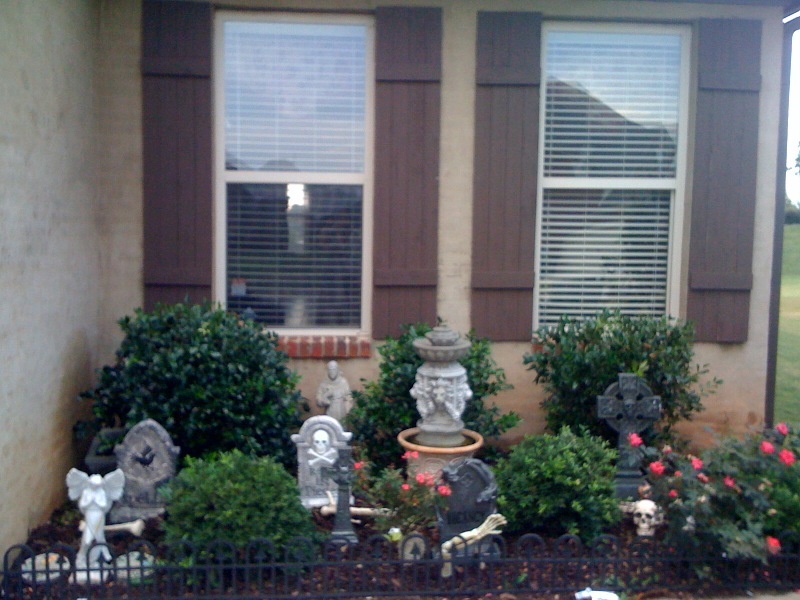 It would be terrible if I had a pet cemetery in my yard! Frog Queen, thanks,,, but I know yours will be twenty times as magnificent. I really can't wait to see yours.